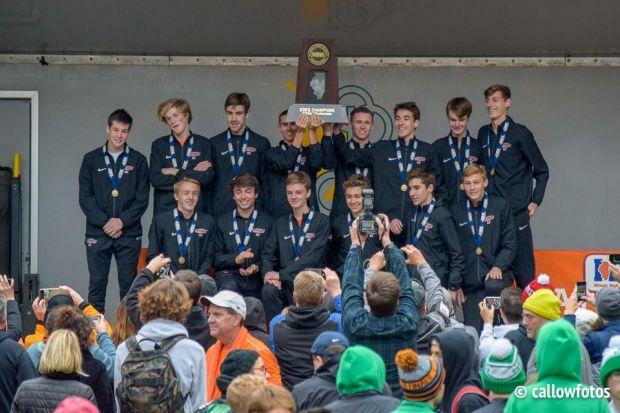 The race to become the best runner in the state did not have a clear favorite entering the year. It was almost exactly the opposite of last year where everyone knew it would be Danny Kilrea or Dylan Jacobs to win the title. But you could have made an argument for about 5-10 runners this year that had a chance to win. Among the flock were Josh Methner (Jr., Hersey), Thomas Shilgalis (Sr., Naperville Central), Tommy Brady (Sr., Maine South), Ethan Kern (Jr., York), Sam Rivera (Sr., Whitney Young), Jack Roberts (Sr., Downers Grove North), and Rory Cavan (Sr., Glenbard West). After some strategic racing into both the 1A and 2A races that led to slower opening miles, we finally saw a boys' race that wasn't willing to stall from the gun. The lead pack, led by Methner, Rivera, Brady, Roberts, Stephen Moody (Sr., Glenbard West), and Kern came through in 4:40. It was virtually the same group that entered the "Bermuda Triangle" able to come out of it in good shape. However, there was a feeling that Methner and Brady were gearing up to separate themselves from the pack. They subsequently dropped the pack passing through the second mile in a 9:27. Both runners knew it would come down to a gutsy finish but neither was not about to let up. Brady hasn't shown the best footspeed this year as he has lost some big-time races in the final sprint. It looked like he knew this too as he tried to make his move 1200 meters out from the finish, but he could not control Methner. Methner essentially and methodically wore out a tired Brady to claim his first state title with a time of 14:11. He ended up setting a new junior school record for the Huskies by a second; the previous record holder was Huskie great, Kevin Havel, who ran a 14:12. This time was also the 9th fastest time ran by a 3A runner at the state meet and the third fastest time by a 3A junior. 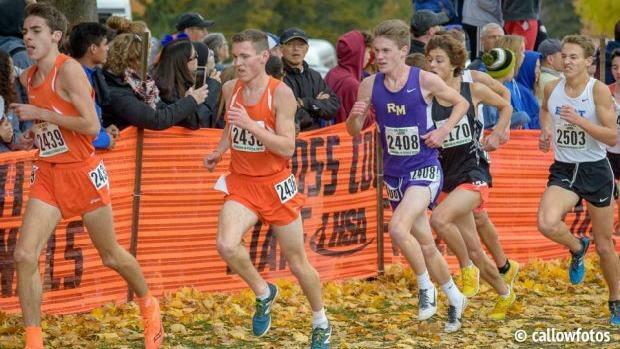 We will have to see how Methner represents Illinois at NXR this upcoming weekend. It took 14:50.48 to earn all-state honors- only 2010 and 2012 were faster. The aftermath was just as thrilling with Brady earning a nice consolation prize in 14:17. Rivera just missed his former teammate's Clayton Mendez's school record by running 14:24. Roberts, who was out for a significant portion of the second half of the season due to injury, blitzed from 7th late in the final mile to finish 4th in a personal best 14:29. Cavan salvaged his season with a 5th place effort ahead of teammate Moody 14:29.9-14:30. It was one of the fastest races in the three-classification system as 45 runners broke the watershed 15:00 mark. The team race went about as expected with #1/US#3 Wheaton-Warrenville South coming out on top with a score of 116 points. Hersey took the Silver plaque with a score of 156 points and Neuqua Valley surprised some pundits, grabbing the Bronze trophy tallying 159 points. Even the great teams will have a so-so performance now and again, but the key is to rebound when it counts. The Tigers were able to do that with the intensity of the state championship on the line. Coach Chris Kuntz's troops dropped scoring placements of 6th, 10th, 11th, 44th, and 45th, 67th, and 151st. An interesting fact about the last three team 3A state champions is that each of their top runners took 8th place at the state meet. Neuqua Valley had a huge performance considering they lost arguably the top runner in the state, Zach Kinne, as he moved to Pennsylvania. But the team was still able to walk away from the meet with a trophy in hand and an unexpectedly happy ending to their season. York took 4th with a team entirely made up of juniors and sophomores. With room to build, the Dukes could be the preseason number one team next year. St. Charles had been ranked second most of the year and came up a little short here with a fifth place finish. O'Fallon taking 7th and Barrington taking 9th were two big surprises on the boys' team side. It was a very interesting battle for sure and may go down in history as one of the best all time.